How do I see all the social media accounts that I have setup? How do I view the login information for our business social media accounts? Step 1) Login to your website control panel. 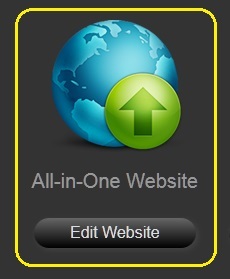 Step 2) Click on the All-in-one Website icon. Step 3) Click on the blue 'Edit Settings' button on the same line as your website. 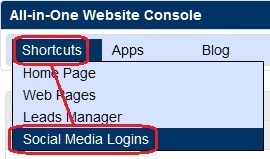 Step 4) Click on 'Shortcuts' on the top-left and then on 'Social Media Logins'. You should now have a list of all of your social media logins that have been setup. Note: Only accounts that are setup will have login information.